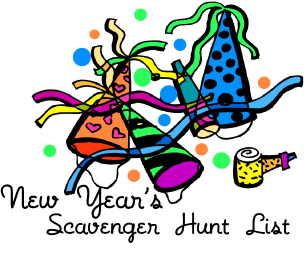 Use this free scavenger hunt list for your New Years Eve Scavenger Hunt - 25 fun items to find! The New Year's Eve Scavenger Hunt List is free to print out. Divide guests into teams. Teams take different areas of the neighborhood - if you have 2 teams have one team take the odd number houses and the other team take the even number houses. Always have at least one adult with the teams at all times. Once the items are collected the first team back to the house within a certain time limit wins. Those who get back late are given a penalty - 1 item for every 5 minutes they are late. 6. Something that says "New York"
25 fun questions to answer.